Palt is a traditional Swedish meat-filled dumpling, of which there are many different variants. Palt is traditionally served with butter and lingonberry preserves, and a glass of cold milk on the side. Pitepalt is a potato palt and the speciality of the city of Piteå, though variants are eaten in the whole country. This Swedish dish has almost as many variants as households in Piteå, but they have in common a mix of wheat and barley flour (whereas other variants of potato palt may use other flours such as rye, or exclude the barley), and can have either other filling than pork, like minced meat, or none at all, then referred to as flatpalt. All palt is made of raw potatoes, while the dumplings made out of pre-boiled potatoes are referred to as kroppkakor. This gives the pitepalt a darker color in comparison. Blodpalt is an old-fashioned Swedish dish still fairly common in northern Sweden and Finland. The dish's history goes back to a time when the households carefully made use of all parts of the animals to get enough food. Blodpalt is made out of blood (cattle or pig in the south, reindeer in the very north) mixed up with flour where the most commonly used are rye, wheat and/or barley. After allowed to swell over night, mashed winter potatoes are added. The "dough" is then formed into lumps and boiled until they float up, and then served with fired pork. This made the dish a nutritious meal often eaten during the dark part of the year. In North America, palt is a dish made with raw potatoes and chopped meat such as bologna, bacon, or sausage, with flour as a binder. It is formed into a ball and then boiled, and served with melted butter. Peel ang shred the potatoes ("old" potatoes - the best potatoes are those you get in winter, that aren't fresh from the ground). Drain the liquid. Mix the shredded potatoes with flour and salt to a dough. Take a big pot and fill with 3 l (12 cups) water and 2 tbsp salt and bring to a boil. Flour your hands, take a bit of dough (slightly smaller than a tennisball) and roll to a ball. Make a hole in the ball, big enough to put about a tbsp of bacon in. Make sure to close the hole properly or else the bacon will fall out when its cooking. 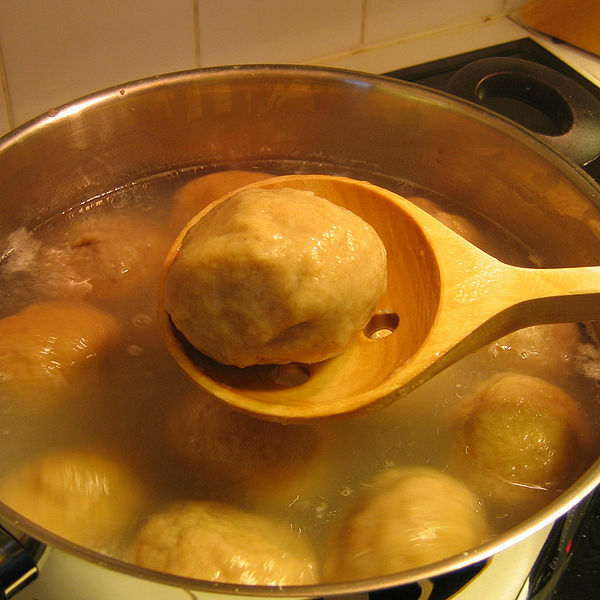 Put the palt balls in the boiling water one by one as you finish rolling and filling them. Stir carefully among the balls while cooking. When the last ball is in the pot, let them all boil for about 45 minutes. If you have any leftover bacon, you can fry them until crunchy. Serve the palt with lingonberry jam, butter and the crunchy bacon. Milk is also a common accompaniment to this dish.